NEVADA – Vancouver’s Seabridge Gold has completed a non-brokered private placement of 1 million shares at a price of $14 each. That gives the company a tidy $14 million to fund its 2019 drilling program at the Snowstorm gold project. The placement is expected to close on or about Nov. 23, 2018 and is subject to customary closing conditions. 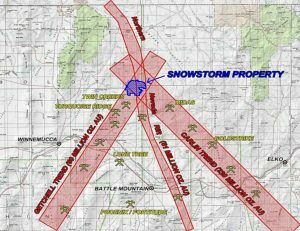 The Snowstorm property lies at the intersection of the Carlin and Getchell trends where they cross the Northern Nevada Rift Zone. Seabridge purchased the property in 2017 from a private company, Paulson and Co., and staked some additional claims. Geological and geophysical evaluations have documented hydrothermal alteration zones consistent with nearby producing mines. The previous owner explored the property over a 10-year period until 2013. The owner gathered 12,000 surface geochemistry samples, 466,000 ground magnetic survey readings, and 4,180 detailed gravity readings. Drilling included 33,245 metres of core and 17,385 metres of reverse circulation work. Exploration permits are in place for the work Seabridge plans to do this year and next. The company has also posted a $250,000 reclamation bond covering the work it will do. Learn more about Seabridge at www.SeabridgeGold.net.